This is the first presentation of the OK Hazards Workshop on November 2nd. 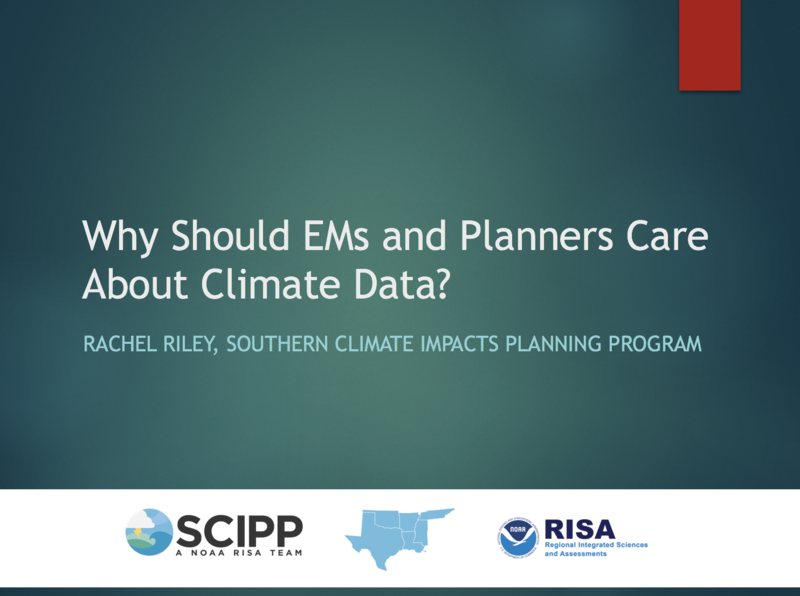 This second presentation for the November 2 workshop gives examples of how climate data can be used in hazard planning. OK Planner & EM Workshop - 1. Introduction: Why Are We Doing This? This presentation introduces the topic of planners and emergency managers working together. It was presented during a workshop that SCIPP held on March 23, 2017. This is a presentation from City of Oklahoma City emergency manager Frank Barnes and planners Ken Bryan and Steve Rhodes on how they work together. 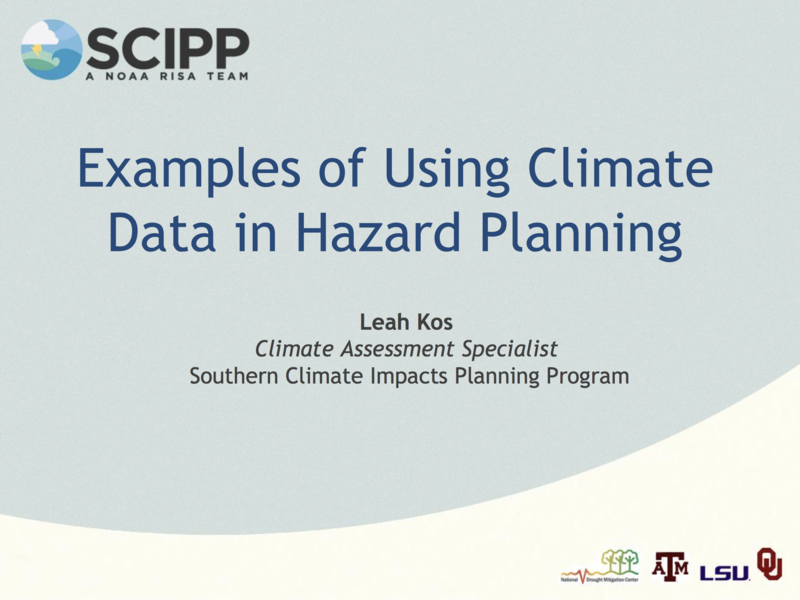 The presentation was given at a workshop that SCIPP held in Oklahoma on March 23, 2017. Presentation from Barry Hokanson on planning for disaster resilient communities. Presentation given at workshop held in Oklahoma on March 23, 2017. Agenda from a workshop held in Oklahoma with planners and emergency managers on March 23, 2017. 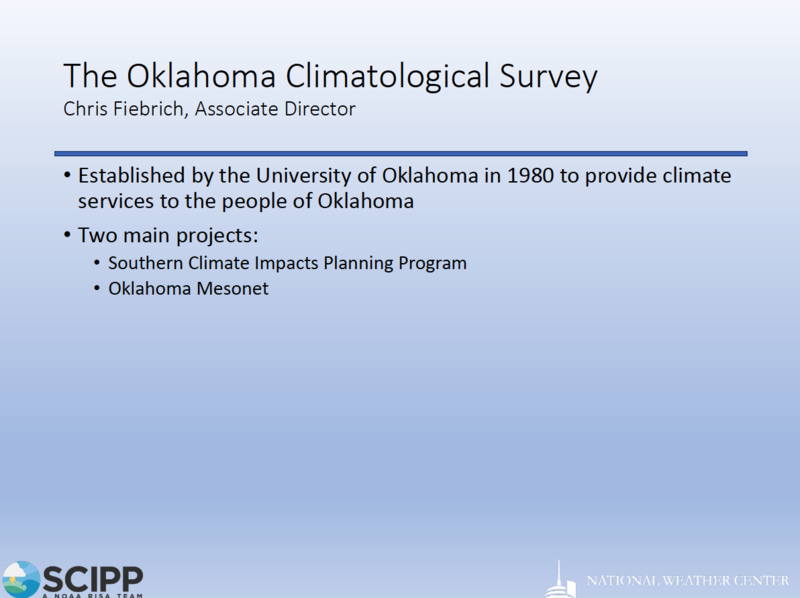 An overview of the Oklahoma Climatological Survey given by Dr. Chris Fiebrich at the Weather and Climate Impacts to Military Operations Workshop on September 10, 2018. Historical drought information for Oklahoma climate division 1, which covers the northwest corner of the Cheyenne-Arapaho tribal jurisdiction and Beaver, Cimarron, Ellis, Harper, and Texas counties.